This is a collaborative mural created during the summer of 2014 by Sike and myself. It's located on the corner of 5th and Troup, Kansas City, KS 66102 (here's a map ). 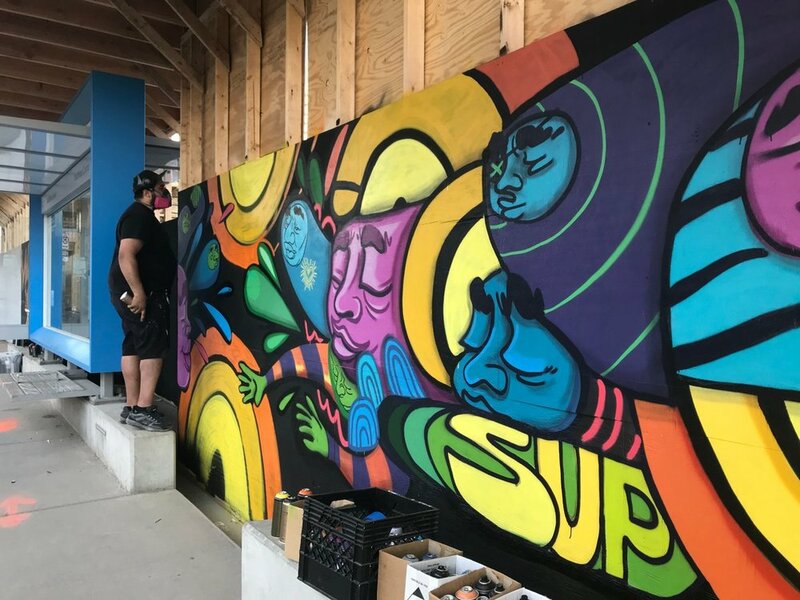 The mural itself is the first collaborative art piece that we've completed. With the recent passing of Maya Angelou, we decided that it would only be fitting to honor her with a mural. This mural, for me, holds a place of importance in my life because it's the first large scale work that I've been able to complete in Wyandotte County, which is my home town. In a sense, I feel as though I've finally been able to use my talents for good by taking the first step to giving something back to my community in the forms of neighborhood beautification. The wall roughly measures about 75 feet wide and 9 feet tall. All in all, it took us about 40 hours or more of labor to complete with the help of Chez (Christyna Sanchez) and SIKE's Intern X (Megan Ebel). A big shout out goes to my grandmother, Al donna Daniels, for organizing a systematic clean up of the building, the parking lot and the surrounding area. She (and a few locals) not only helped to clear out unwanted weeds, but they managed to help kill an annoying bush; removed trash from the lot; and were able to contact the city in order to come and collect the trash they put into bags. She said that, on the first day of cleaning (alone), a guy who reaked of alcohol, stopped, asked what she was doing and then proceeded to help her for the next couple of hours just for the sake of helping. That gesture by the community was greatly appreciated. It was a reassurance that, when efforts are made to beautify your surroundings, people do take notice and that people inevitably are just waiting to become a part of the change, but that YOU may have to initiate it first.